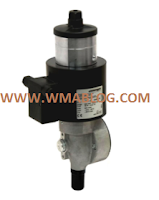 Solenoid actuators are designed to operate VF and VFH butterfly valves.When the coil is not energized the inner spring pushes down the plunger and, by means of a gear mating, shifts the connected valve to the minimum opening position. When the coil is powered the plunger moves up fast (SR) or slowly (SL-ST), shifting the valve to the maximum opening position. This type of device, connected to VF and VFH butterfly valves, is used in two-stage control of gas and air flow in combustion processes.